The crystal is magnificent. Deep blue, with perfectly defined faces and edges and absolutely undamaged. Furthermore, its situation on matrix makes for easy direct observation and as well as display in exhibit case. 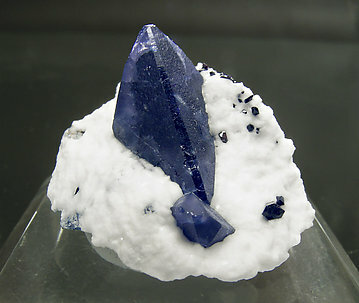 Very sharp Benitoite crystal on matrix. 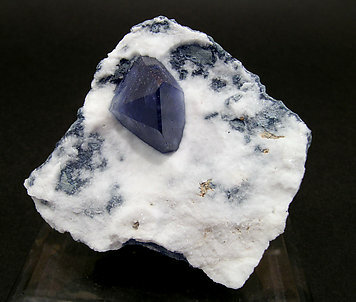 It has very well defined faces and edges and a very deep and uniform color. 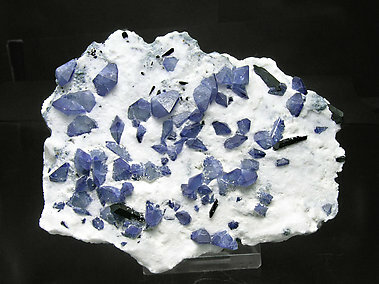 A plate covered by many very well defined crystals of good color and luster, with small crystals of Neptunite, contrasting with the white Natrolite that covers the matrix. 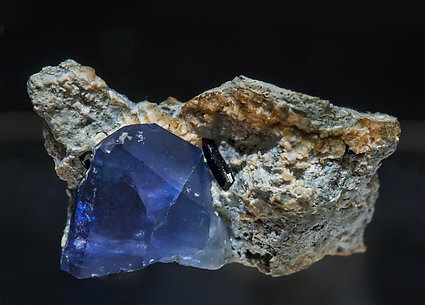 Both crystals, the main one, very big, and the little one on the lower part of the specimen, have very good color and luster, in sharp contrast with the white Natrolite matrix.